We love our gadgets. Whether we’re out and about with a sports tracker strapped to our wrists, or rustling up something delicious in a gizmo-filled kitchen, gadgets are a part of everyday life. In the living room, gadgets have progressed rapidly from the heady days of mini fridges and gloop lamps, to today’s tech-filled living space stuffed with robo-vacuums, floating side tables, and Alexa chatting to us in the corner. So what are the current favourites, and how will they help you live your life? The big news for living space gadgets at the moment is ‘smart’ technology such as lights and heating that you control with your phone. This enables you to get your home nice and welcoming before you get in, by turning on lights and increasing the heating remotely. Systems such as Hive have changed the way we think about smart technology around the home, and although the First-Gen systems do have a few teething problems, next-gen upgrades will enable us to do even more from our phones. This smart tech is all part of the ‘Internet of Things’ – a collective term for gadgets that connect to either static or mobile systems via the internet through your Wi-Fi and a home hub. They’re handy gadgets to have but make sure they don’t leave an open back-door that hackers can use to remote access your network. You’ll see these little pods popping up everywhere this year, and it’s set to be a big seller as a tech-lover’s Christmas present. Voice activated smart speakers such as Alexa, the Dot, and Google’s Home Mini give you a range of options from personal reminders, activating smart bulbs, playing music, or searching Google to settle that Trivial Pursuit answer debate on Christmas afternoon. Again, the Version one generation have their glitches, but later upgrades to software has made Alexa 2.0 and her friends very effective, and are essential living room gadgets for 2017. Floating side tables aren’t so much a gadget, but more of a design style. They certainly challenge the traditional concept of a side table, and add a quirky, individual twist to a living room. There is, however, some debate in the interior design world as to when a floating table actually turns into a shelf! Nevertheless, floating tables (which appear to have no visible means of support) are a big trend for 2017/18, and the perfect place to pop Alexa so she’s out of the way of busy little hands! Robo-vacuums are still big news, and the best bit is they’re getting much, much better at finding their way around. They can also be controlled with a home hub smart system, so you can get them to do the cleaning while you’re out at work or at the shops. Possibly one of the more useful living room gadgets for time-poor modern homeowners. If you’re starting to find mobility more difficult, then an electric riser recliner could be the most comfortable and most useful bit of living room tech you invest in this year. 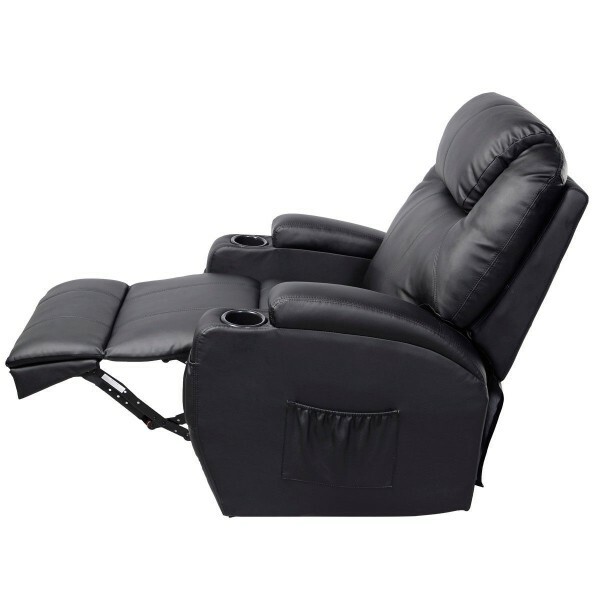 Starting at around £500 for a basic model, electric riser recliners gently lift you up from the seated position, so that it’s easier to stand without struggling to get up. If you do feel you would benefit from one but don’t have the money then it’s worth talking to your local council, who may be able to help you with a grant towards the cost of the equipment (depending on your status). Recliners also let you relax, sit back, and enjoy the very best of your new UHD-ready curved screen TV, or immersing yourself completely in a virtual world through the use of VR goggles. Dim the recessed LED lights using your phone, pop your clutter away in an Ottoman, and learn to love your living room again. No matter what you do in your living room, new technology and a cluster of handy gadgets are now making the experience even more enjoyable.